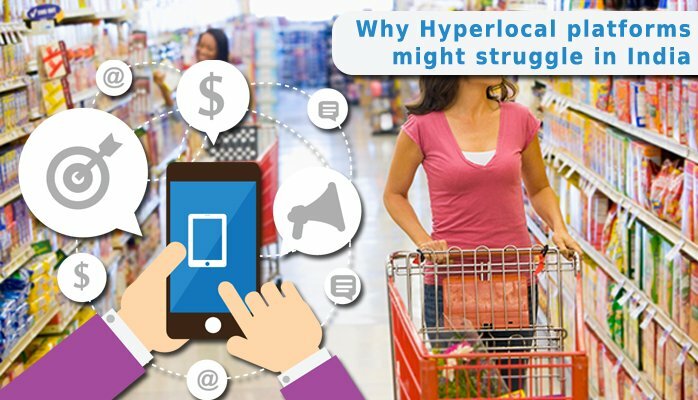 Hyper local has been a buzz word in Indian Internet startups for more than a year now. We had first “Local” and a lot of companies striven cracking it, but all came out of it with a broken limb or two except for Just Dial. Even before we could crack the “Local” industry “Hyper-Local” made an entry. 1.One thing which is common across all these hyper local startups is the process followed – they put your inventory online; make the purchase happen from their portal or app; pick-up goods from the retailers shop; and deliver to the end customer. The retailer doesn’t have any visibility on the end customer. They just receive a blind order; the packaged goods are thereafter picked up by the delivery boy, to be delivered to the right customer. In this process there is lack of customer experience, gaining trust via human interaction and building loyalty, so you could have lost all your identity and assortment and your business gets totally commoditized. 2.Experts believe the high cash burn rate and paper-thin margins are making the going difficult for the not-so-well funded start-ups. High competition in this space is making it the battle of the riches. You can’t make money in this market without reaching scale and you can’t reach scale without burning cash,” a founder of one of the hyper local start-ups told business line on condition of secrecy as the firm itself is struggling to get funding. The entrepreneur said that due to the huge competition, salaries for delivery boys are increase rapidly, making delivery cost much higher than the margins. c.Customer feels that the delivery boy / company is playing smart by selling promoted / high margin products on the pretext of out-of-stock. 4.Product Returns, not an easy matter – For all returns (full or partial), delivery person goes back to retailer, cross verifies returned products and submits the same back, taking the cash. There by adding to operating costs as well as to overall operating duration in market. 5.Multiple Deliveries, from multiple areas – The delivery boys or any team which managing the order life cycle cannot be productive for their entire work time. Resulting in managing disruption shifts and other difficult structures. The cost of a trip becomes high and also food is a small ticket cost effective purchase, it will be unable to fund an expensive delivery model. This will force businesses to club multiple orders in a single trip, which in turn will lead to delayed deliveries and customer frustration. 6.Plastic packaging –It is global in the approach food delivery sector, across all the price points, from budget to hedonistic food. None of the restaurants being environmentally and socially responsible for the plastic and packaging they bring into the household with every delivery. you will see the infernal hades wrap that is the end result of thousands of working class people who didn’t have the time to cook for themselves. Huge loads of polythene plastic lay around, burning slowly, diffusing dioxins into the air. These plastic bags also block channels during rains and cause flooding.